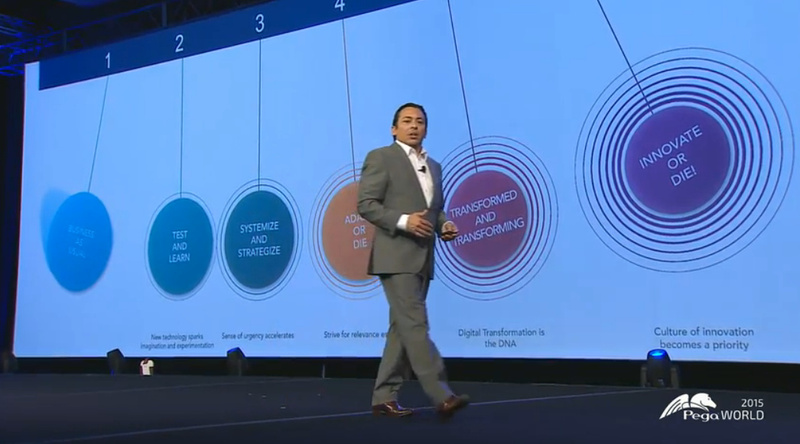 PegaWORLD 2015 Keynote with @BrianSolis: Innovate or Die! Brian Solis from Altimeter Group was the starting keynote, talking about disruptive technology and how businesses can undergo digital transformation. One of the issues with companies and change is that executives don’t live the way the rest of us do, and have to think of the shareholders first, but may not have sufficient insight into how changing customer attitudes and the supporting technology will impact their profitability, or even their ability to survive. “A Kodak moment” is now about how you go bankrupt when you ignore disruptive technology: not something that you want to capture for posterity. Solis’ message, in short: if you don’t disrupt yourself, someone else will do it for you. Innovate or die.